After a year on the market, Apple speed bumped the eMac from a top speed of 800 MHz to 1 GHz while moving from a 100 MHz data bus to 133 MHz and adding support for 802.11g AirPort Extreme WiFi. Apple also switched from the Nvidia graphics of the original eMac to Radeon 7500 on this model and moved from a 2x DVD-burning SuperDrive to a 4x one. The 2002 eMac came with a new mouse and keyboard. It also has video out for external displays, which will mirror whatever is displayed on the internal monitor. This is the last eMac capable of booting into the “classic” Mac OS; later eMacs can only use Mac OS 9.2.2 via Classic Mode in Mac OS X. 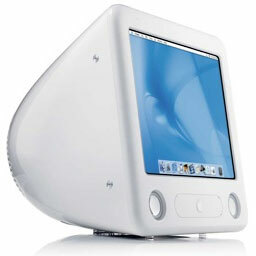 Although its dimensions match the original iMac, the eMac is quite heavy – 50 pounds vs. 35-38 for the 15″ iMacs. This was the last eMac to use USB 1.1; later models have USB 2.0 instead. Got an eMac? Join our iMac & eMac Group or iMacs & eMacs Forum. Introduced 2003.05.06 at US$799 (800 MHz CD-ROM), $999 (1 GHz Combo), and $1,299 (1 GHz SuperDrive); 800 MHz model discontinued 2003.10.22 and prices dropped to $799 (Combo) and $1,099 (SuperDrive). Replaced 2004.04.13 by 1.25 GHz eMac. Mini VGA to S-video Adapter a No Go for eMacs, Dan Bashur, Apple, Tech, and Gaming, 2009.11.24. You might think that Apple’s Mini VGA S-video adapter is a cheap way to connect your eMac or G4 iMac to your TV. You would be wrong. Upgrading your eMac for better gaming and hi-res video performance, Carl Nygren, Classic Macs in the Intel Age, 2008.07.11. This eMac started out with too little RAM and not enough hard drive space. With several upgrades, it plays games quite well and handles HD video content nicely. Hasta la Vista, hello again eMac, Charles Webb, The Webb Chronicles, 2008.07.10. After fighting system slowdowns in Vista on a new Core 2 Duo Dell for 3 months, it was time to dig out the old eMac an become productive again. 1 working eMac from 2 broken ones, Dan Knight, Mac Daniel, 2007.11.14. A pair of matching eMacs, each with a different failure, results in one working eMac and lots of leftovers. Screen Spanning Doctor lets you use a second monitor with your eMac and span screens, not simply mirror you internal display. Apple eMac Upgrade Guide is a great resource for information and pictures showing how to upgrade your eMac. Now get out there and make the most of your low-end Mac. Upgrading Apple eMac, Leo Bodnar, 2004.01.04. How to overclock an 800 MHz eMac, upgrade the hard drive, replace the CD-ROM, and add an external monitor complete with spanning. You cannot plug the iPod shuffle directly into the eMac’s USB port – it will not fit. It will not charge if plugged into a keyboard USB port or an unpowered USB hub. To charge it while using it with your eMac, you must us a USB extension cable, powered USB hub, iPod shuffle dock, or a USB power adapter.